The past week has been productive! I have been able to do a fair amount of detail work that will not show particularly well in these photo’s but I am very pleased with my progress. Today I was able to place the transom assembly in it’s proper position and can finally see the complete lines of the boat. The photo still shows alignment issues but this is because nothing has been epoxied. 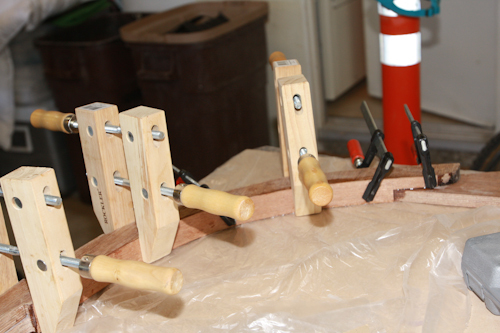 The frames are loosely setting in the backbone assembly waiting for more detail work before alignment and epoxy glue. 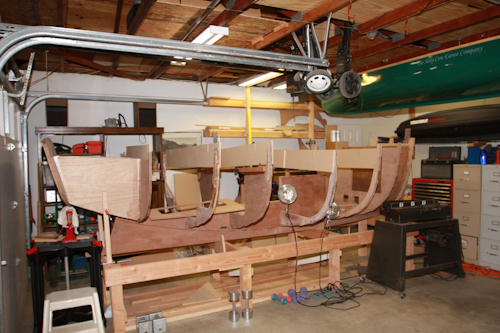 First view of Ebihen with transom frames in position on backbone. Here are some of the detail photo’s showing progress that has been made. 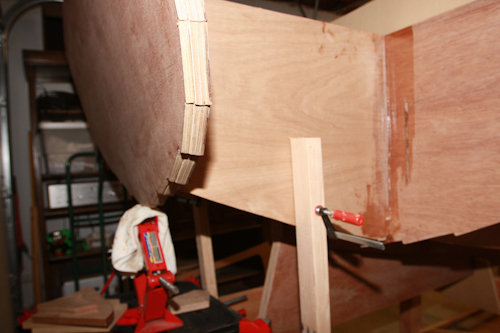 Working on the transom bevel. Lots of work to make the correct angle. The Transom was too heavy to lift, so I dragged the assembly table over to the boat and used a car jack to raise into position. Adding 3mm strips of Mahogany to the plywood edges of frames. I like your boat very much. 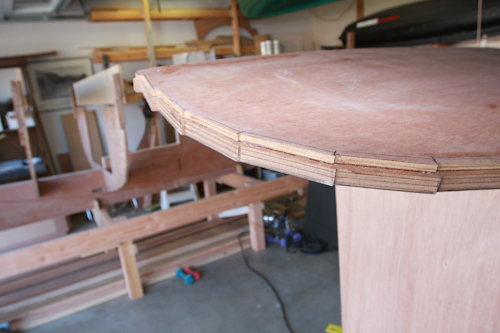 Could you name the tools (or just the main tool) used to make the bevels on transom, frames and stem? You must be enjoying your boat in the water I think, that is why we have not seen any new post. There may be a better way to cut the bevels, but after joining the two plywood transoms together I simply used a hand held belt sander and a rasp file to shape the bevel for each plank. 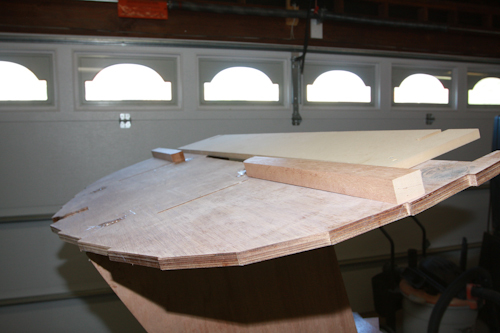 The two transoms were cut to the size of the full sized plan for each transom part and the bevel offset was pretty much built it once the parts were epoxied together. I just needed to take off the peaks and make the bevel smooth. 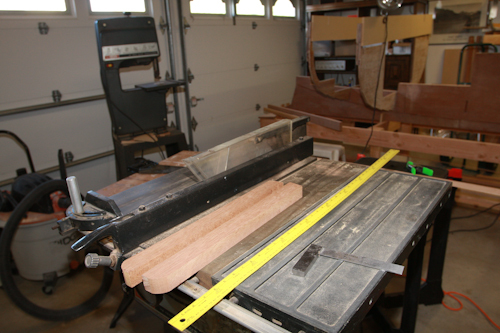 Final adjustment to the bevel was made for each plank as it was attached with a hand file. Epoxy was quite useful as both the glue and as a filler for any bevel that was not perfectly true. I am not quit in the water yet. A few weeks off for vacation time and work on the trailer.